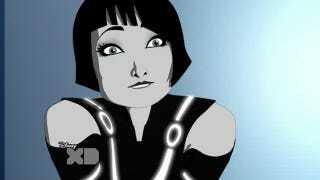 Movies and cartoons collide this week, as Quorra (Olivia Wilde's character in Tron: Legacy) appears on Tron: Uprising. We also see the fruits of Skrull labor pay off this week on Avengers: Earth's Mightiest Heroes and what happens when Bender joins the ranks of the paparazzi on Futurama. Adventure Time and Regular Show are off until after San Diego Comic-Con, but we have plenty of clips and previews this week, including a look at a LARPer quest on Motorcity. As always, minor spoilers ahead! Avengers: Earth's Mightiest Heroes – "Infiltration"
The Skrulls, hiding in the shadows the entire season, have finally begun their attack on Earth. The little green men choose to invade Wakanda, home of the Black Panther and Storm, first. Carol Danvers (Ms. Marvel) is sent to save Wakanda, as most of the Avengers are wounded after an attack on Asgard (or were they?). Iron Man: Armored Adventures – "Iron Monger Lives"
In the alternate universe of Iron Man: Armored Adventures, Obadiah Stane (the baddy from the first Iron Man movie) and Iron Monger return to the fold and back into the lives of Howard and Tony Stark. In this clip, Howard Stark is debuting the Starkpod, while War Machine and Iron Man fight off would be saboteurs. This episode focuses on Paige, using flashbacks to show her past life and love of music, a talent that goes against her programming. During this flashback, we see Paige interact with Quorra (voiced by Tron: Legacy's Olivia Wilde), who gives Paige some life changing advice. Futurama – "The Thief of Baghead"
Bender becomes a member of the paparazzi in this episode, getting a job at US People working for a giant slug/larvae modeled after TMZ's Harvey Levin. In this clip, Bender artfully creates a bit of sensationalized news on the job. Motorcity – "Ride of the Fantasy Vans"
We have not covered Motorcity before on SMC, but this episode revolves around Live Action Role Playing, so I'm all in. The show takes place in a futuristic version of Detroit (sans OCP and Robocop) owned by Mark Hamill (he voices the main baddie, Abraham Kane). Motorcity features some interesting voice talent, including Jim Breuer and Twisted Sister's Dee Snider. Gravity Falls – "The Hand That Rocks the Mabel"
A real-life psychic comes to Gravity Falls, with Mabel and the crew enthralled by a commercial for "Gideon's Tent of Telepathy." Gideon's show, however, is encroaching on the Grunkle Stan's business, creating some trouble for the kids. Check out the fine print after Gideon's commercial for a few laughs. Ultimate Spider-Man – "Strange Days"
Doctor Strange (sounding a little bit like a young Stan Lee) is the star of this episode. Strange holds the key to breaking a spell that holds the city of New York (along with Spider-Man and Iron First) in a nightmarish trance. Top image courtesy of Disney XD. Gravity Falls airs Friday nights on the Disney Channel. Futurama airs Wednesday nights on Comedy Central. Iron Man: Armored Adventures airs Wednesday nights on Nicktoons. Tron: Uprising and Motorcity air Thursday nights on Disney XD while Ultimate Spider-man and Avengers: Earth's Mightiest Heroes air Sunday mornings on the same channel.